Happy New Year, everyone! To start off 2015, I'm delighted to present an interview with the prolific pre-Shortzian constructor I. Judah Koolyk, who had a total of 40 crosswords published in the Maleska era! Judah first contacted me early last month. 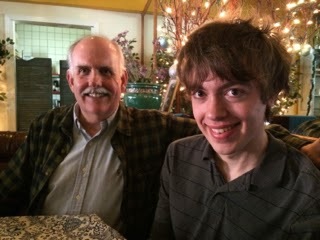 He introduced himself and mentioned that he'd discovered this site; he also included a long list of the publication dates of all his Times crosswords (and even his variety puzzles!). I was very excited to hear from him and sent along some additional dates of puzzles listed as being his. When I asked whether he'd be interested in being interviewed for this site, he said he would, though he wondered (needlessly) whether anyone would be interested and worried that his answers might be "too boring"! (He also mentioned that his 15-year-old daughter would be thrilled to see that her dad was so famous!) To read Judah's eloquent and informative interview, click here or on the Pre-Shortzian Constructor Interviews tab above. Despite the holiday season, it's been very busy on the proofreading front over these past two weeks! On Sunday the 20th, Todd Gross sent in 10 puzzles with 17 mistakes, then 8 more with 15 mistakes on Monday night and 10 with 14 mistakes Tuesday night. Christmas Day Denny Baker sent in 35 puzzles. On Saturday afternoon Mark Diehl sent in 31 puzzles and then 29 more that night. Sunday afternoon he sent 28 more, then a few hours later another 25, then 30 more that evening, then 31 more later on—whew! Monday he took a brief break from proofreading so we could meet for lunch since he was in the area—we had a great time eating pizza in Echo Park, followed by a sojourn to a fascinating place nearby called the Time Travel Mart (a fitting destination, given our time travels through pre-Shortzian puzzles!). Tuesday afternoon Mark sent another 31 puzzles, and then Wednesday morning Todd sent in 12 with 19 mistakes, which were followed by 30 more from Mark. Thursday morning Mark sent 28 more, and then another 28 that afternoon, followed by 33 more, and then 30 more that night—whew again! Finally, Friday afternoon Todd sent 10 more puzzles with 25 mistakes. What an amazing two weeks of proofreading—thanks so much again, everyone! Mark Diehl and me taking a break from the project. 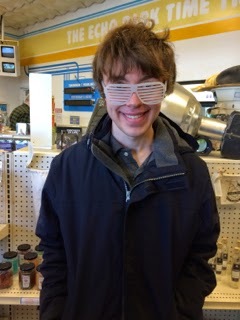 Wacky glasses at the Time Travel Mart. Congratulations to Barry Haldiman, who, on Friday the 26th at 9:55 a.m., was the first to solve the December 19 Blast! from the Past challenge! The challenge, from the puzzle published on April 8, 1959, was to guess the three-word clue for the entry HAIRDO; the solution was "Woman's top problem." Todd Gross came across a great clue-entry pair while proofreading recently, and I've decided to make it this week's Blast! challenge, which you'll find in the sidebar. As with previous Blast! challenges, a new letter will be added every day, hangman-style. Thanks so much again, Todd—and good luck, everyone!